From the late 20th century until the present time, researchers in the broad field of psychological science have been noting the need for refined intellectual frameworks to arise (Homskaya, 2010; Kandel, 1998, Rossouw, 2011; Rossouw, 2014). Western views that are presented in the following pages refer to “…the dawn of the mental health renaissance.” (Rossouw, 2011, p. 3), which was heralded by the “…new intellectual framework in psychiatry” (Kandel, 1998, p. 457) and the corresponding technological advances in the neurosciences. As a result, the emerging field of brain-based care is rapidly gaining momentum – a neuroscientifically informed therapy or neuropsychotherapy (Grawe, 2007, Rossouw, 2014). In the early years of 20th century a group of academics in the field of psychology in Russia formed a new school, which during the restricted times of Soviet regime received insufficient recognition on a global scale (Kostyanaya & Rossouw, 2013). The investigators aimed at developing an “objective” approach to understanding the connection between mind and brain with latest research focussed on the problem of personality, its neural correlates and the impact of society on human mental functioning (Homskaya, 2010; Luria, 1979). Due to the opening of the iron curtain and present-day globalisation more literature on Soviet psychological developments is being translated and is becoming available for a broader audience (see, for example multiple works of Akhutina (2003), Akhutina & Pylaeva, 2012; Leontiev (2005a, 2005b, 2012, 2013), published in English). This new state of affairs allows the comparative analysis of Soviet paradigms and the contemporary Western paradigms which is the general aim of this paper. In the first part of the paper a neuropscyhotherapeutic framework is presented, starting with an outline of its roots and most current conceptualisations of neuropsychotherapy as a research field. The second part of the report focuses on the development of Soviet school of psychology and its main postulates. The third part of the report includes the comparative analysis of the two paradigms as well as a consideration for future analytic inquiry in this area. The final part of the paper closes with a succinct conclusion. Several fascinating historical traces can be identified while tracking the way in which researchers tried to conceptualise the interaction of mind and brain in human functioning and what can be done in order to improve it when dysfunction occurs. As early as 1895 Sigmund Freud, the “father of modern psychology” (Rossouw, 2011, p. 2), was challenged to explain the functioning of the mind in the terms of neural correlates of the brain. In his “Project for a Scientific Psychology” (1895) Freud intended to “furnish” psychology as “a natural science” while introducing the principle of neuronic inertia and the function of the identified types of “the material particles in question” or in other words neurons (pp. 355-356). Despite these fundamental discoveries as well as insights into the possibilities of “talking therapies”, i.e., human external and internal experiences to change the brain, Freud gave way to another direction in his research inquiry (e.g., unconsciousness, interpretation of dreams), leaving future researchers to bridge the link between neuroscience and psychotherapy (Rossouw, 2011). Subsequently, the debate and scientific hegemony in explaining human functioning was performed by authors who often supported rather extreme perspectives. For instance, Breuer, Freud’s coeval, believed “…there will be little said of the brain…Physical processes will be discussed in the language of psychology…There is no alternative” (Freud, 1895, p. 356). By contrast, years later, Hans Eysenck (1952) firmly stated that psychotherapy is the “mere passage of time”, while Timothy Leary likened therapy interventions with the ones performed in waiting lists (Linford & Arden, 2009, p. 16). Thereafter, since the 1970s and the introduction of Prozac and the DSM-III, the “golden era for psychoparmacology” (Rossouw, 2011, p. 3) – the pax medica or “medicalised psychology and psychiatry” (Linford & Arden, 2009, p. 16) took its turn, leaving psychotherapy in the background. In response to the requirements of “empirically validated treatments” as well as the superiority of diagnostic methods pertaining to that time, Aaron Beck (1976) dared to “establish indisputable evidence” (Linford & Arden, 2009, p. 17) of psychotherapeutic efficacy by means of cognitive-behavioural therapy (CBT). However, in the 1980s and afterwards, Beck’s focus on specific CBT techniques was criticised by researchers who managed to show that the patient and common therapeutic factors are the most powerful elements in the outcomes of therapeutic treatments (Cozolino, 2002; Lambert & Ogles, 2004; Smith et al., 1980). Instead, “the brain-based perspective” was put forward, allowing for new and broader cross-disciplinary or a biopsychosocial view on psychotherapeutic interventions (Linford & Arden, 2009, p. 19). Most current investigators in the areas endorsing biopsychosocial-spiritual view on human functioning argue that major advances in neurobiological research within last decade have brought about “a paradigm shift” or in other words “the mental health renaissance” (Linford & Arden, 2009; Rossouw, 2010b, 2011; Sulmacy, 2002). In particular, Rossouw (2010b, p. 5) states that when based on neuroscience, “talking therapies” face “new challenges” and “exciting new possibilities”, while the paradigm shift was made in a path from “the helping model forward to a recovery model” and from “the recovery model forward to a model enhancing quality of life”. The key ideas contributing to the rise of the contemporary mental health renaissance were pronounced in the landmark article of Eric Kandel (1998), the Nobel prize winner in medicine. He stated that the development of “brain sciences” prompted “a remarkable scientific revolution” and that mental health professionals should possess the “ability to encompass mental and emotional life within a framework that includes biological as well as social determinants” (p. 467). Eric Kandel also outlined the interaction between brain processes and environment via alteration of gene expression and, following the strengthening of synaptic connections, as the foundation of human beliefs, attitudes, memories, personality and dispositions (Walter et al., 2009). In addition, he brought forward the important idea of the interaction between patients’ “neuronal machineries” (p. 466) with the “neuronal machineries” of their psychotherapists, foreshadowing the function of mirror neurons – one of the major neurobiological discoveries which is yet to be thoroughly addressed in psychotherapy research and practise (Rossouw, 2010a). Among other most pronounced neurobiological findings contributing to the enhancement of the quality of clients’ lives via psychotherapeutic interventions, contemporary researchers highlight the discovery of neurotransmitters and their operation, neural plasticity, neurogenesis and bottom-up and top-down regulation of mental functioning (Rossouw, 2010a, 2012). As a result, new ways for bridging neurosciences and psychotherapy arise, one of which is neuropsychotherapy – an emerging paradigm of care in Australia, of which a major proponent and theoretician is Dr Pieter Rossouw at the University of Queensland (Rossouw, 2010a, 2010b, 2011, 2012, 2014). In the current literature neuropsychotherapy is referred to as an “increasingly popular field of research” (Walter et al., 2009, S174) as well as the “natural result of neurobiological research” (Rossouw, 2011, p. 3). It is also important to note, that the term “neuropsychotherapy” has been used in different countries and in rather different modalities (Grawe, 2007; Judd, 1999; Kaplan-Solms & Solms, 2000; Laaksonen & Ranta, 2013; Walter et al., 2009). Generally speaking, one group of researchers relate neuropsychotherapy to “the use of neuropsychological knowledge in the psychotherapy of persons with brain disorders” (Judd, 1999, p. 3) or, in other words, working with impacts of “neurological dysfunction or syndromes” in patients (Laaksonen & Ranta, 2013, p. 1). Another group of researchers see neuropsychotherapy as “a specialised field of psychotherapy”, where neurological and neuroscientific knowledge serves for guiding clients “in the process of restructuring their brains towards higher levels of functioning and well-being” (Rossouw, 2011, p. 3; Walter et al., 2009). In this paper the focus is on the latter conceptualisation of a neuropsychotherapeutic framework, which was founded on the cognitive-experiential self-theory of personality (CEST) by Seymour Epstein (2003) and developed by Klaus Grawe (2007). The most recent conceptualisations of neuropsychotherapy as a research field are outlined (Walter et al., 2009) with following future considerations. In his principle work “Neuropsychotherapy: How the neurosciences inform effective psychotherapy” Klaus Grawe, an outstanding Swiss researcher and practician, mentions CEST as the theory, which “particularly intrigued” him and which served as the basis for his consistency-theoretical model of mental functioning (Grawe, 2007, pp. 167-171). One of the main interests of Seymour Epstein (1917-2011), who was emeritus professor in psychology at University of Massachusetts, was the development of a unified theory of personality, which manifested itself in his cognitive-experiential self-theory of personality (2003). This theory is proposed to be compatible with psychodynamic and learning theories, as well as present day views on information processing. The “integrative power” (pp. 159-162) of CEST derives from three main assumptions: 1) People tend to process information by two independent and interactive conceptual systems; a preconscious experiential system and conscious rational system; 2) The experiential system is emotionally driven, organised and adaptive; 3) According to CEST, the proposed four basic needs (the desire to maximise pleasure and minimise pain, the need for relatedness, the need to maintain the stability and coherence of a person’s conceptual system, the need to enhance self-esteem) are equally fundamental and their interaction can account for paradoxical reactions. While the needs “serve as checks and balances against each other” (p. 162), maladaptive consequences occur when needs are fulfilled in a “conflictual manner” (e.g., at the expense of others). It is also suggested in CEST that people automatically construct an implicit theory of reality which includes a self-theory, a world-theory, and connecting propositions. Additionally, the outlined basic needs correspond with four basic beliefs: about the benignity versus malevolence of the world; about the predictability, controllability, and justness of the world versus its unpredictability, uncontrollability, and lack of justice; the degree to which people are loving versus rejecting and trustworthy versus untrustworthy, and about worthy versus unworthy self (p. 164). Epstein and his associates proved to successfully test CEST assumptions predominantly by means of adaptation the procedures used by Tversky and Kahneman (see, for example, Epstein et al., 1992). As a result, Epstein (2003, p. 176) suggests that, according to CEST, the effectiveness of psychotherapy depends of changes in the experiential system and can be achieved in three ways: by using “the rational system to correct and train the experiential system”; providing “emotionally significant corrective experiences”, and “communicating with the experiential system in its own medium – fantasy, imagery, metaphor, concrete representations, and narratives”. The outlined postulates of Epstein’s theory of personality plus his ideas on the experiential system being involved in human tendencies to “achieve pleasurable outcomes and avoid unpleasurable ones” (Epstein, 2003, p. 160) were further elaborated in Grawe’s consistency-theoretical model of mental functioning (Grawe, 2007). Generally speaking, Grawe’s approach represents the transformation of the results of neuroscientific research into psychotherapeutic domain (Draguns, 2007) with the holistic perspective on clients’ functioning. This model is used by the author both as an explanatory framework for general understanding of human mental functioning, the development of mental disorders, as well as the necessary neuropsychotherapeutic interventions to be implemented while working with clients. The reviewers of Grawe’s work see his approach as “an individualised amalgamation of cognitive-behavioural, process-experiential, and interpersonal techniques” (Draguns, 2007). Upon revision of Epstein’s conceptualisations, Grawe (2007, pp. 165-168) suggests the consistency principle as the “very central principle of mental functioning” which also serves as a “condition for the effective satisfaction of the basic needs”. The term consistency is referred to as the “compatibility of simultaneously transpiring neural/mental processes” (p. 168) or to “the internal relations among intrapsychic processes and states”. Striving for consistency is regarded by Grawe as “the ultimate moving force in neural/mental functioning” and, therefore, as a “highest or pervasive regulatory principle” (p. 173). In broad terms, Grawe argues that consistency regulation provides us with understanding of human mental functioning and has to be considered in its context of goal-oriented activity towards fulfilment of basic needs. Therefore, the consistency regulation and need satisfaction are “intrinsically interlinked” (p. 169) by the “connecting construct” of congruence or a person’s “compatibility of current motivational goals and actual perceptions”. Despite his chief emphasis on neuroscientific underpinnings of human mental functioning, Grawe suggests the following question as fundamental for effective neuropsychotherapy: “What is it that moves this person?” (p. 164). The focus on motivational aspects of clients’ lives allows neuropsychotherapists to perform personalised therapeutic interventions, comparable with present-day most strongly endorsed holistic approaches to human suffering (Kleiman & Seeman, 2000). The consistency-theoretical model suggests that mental activity is hierarchically organised and governed by goals and motivational schemas which are formed over the course of mental development. Thus, Grawe defines motivational schemas as “the means the individual develops in the course of his or her life in order to satisfy his or her needs and protect them from violation” (p. 170). In the case of growing up in the environment that is oriented to the fulfilment of needs, the individual develops approach motivational schemas and behavioural repertoires intended for the realisation of goals under various conditions. By contrast, if basic needs are repeatedly violated, avoidance motivational schemas are formed, primarily for protection purposes. A continuous stream of perceptions is produced during the individual’s interaction with the environment, corresponding with situational experience and behaviour and lies at the lowest level of the model (Grawe, 2007) (see Figure 1 below). These perceptions form feedback signals on how motivational goals are being achieved. They are termed incongruence signals, for which Grawe draws upon Power’s control theory (1973). If avoidance dominates over approach, the incongruence signals in regards to unfulfilled approach signals emerge, which creates approach incongruence. In case of inability to avoid feared experiences avoidance incongruence arises. 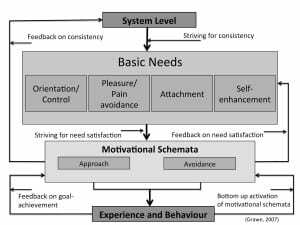 In addition, approach and avoidance tendencies can be activated simultaneously and mutually inhibit each other, which give rise to motivational conflicts or motivational discordance. Motivational conflicts can subsequently lead to incongruence or “mismatch between actual experiences and activated motivational goals” (Grawe, 2007, p. 172). Therefore, discordance and incongruence are considered by Grawe as most important versions of inconsistency in human mental functioning. The continuously repeated failure to fulfil approach and avoidance goals can lead to an elevated incongruence level or, in other words, a highly complex stress state, accompanied with chronically elevated level of negative emotions. According to Grawe, the basic needs provide neuropsychotherapists with the criteria for measurement of consistency in individuals. In the model, basic psychological needs are viewed to be present among all humans and their violation or enduring nonfulfillment is seen as the most important cause of impairments in mental health and well-being of clients (Grawe, 2007). Among basic needs Grawe differentiates: the need for attachment, the need for orientation and control, the need for self-esteem enhancement and self-esteem protection, and the need for pleasure maximisation and distress avoidance. A more refined model which incorporates contemporary thinking in neuropsychotherapy as a unique meta-theoretical framework for understanding the human condition has been recently proposed by Dr Pieter Rossouw (Rossouw, 2014). He states that neuropsychotherapy represents a holistic model that integrates neuromolecular and environmental data for the main purpose of facilitating change in clients and shifting their patterns of pathology towards healthy change that increases quality of life. The author underlines the grey area between “nature” (genetics) and “nurture” (external impact), primarily on the basis of neural plasticity and epigenetics – notions that see the brain as a complex network and that neural activation is susceptible to environmental factors. Based on Grawe’s ideas outlined above, Rossouw has introduced several new features in his integrated model of neuropsychotherapy (see Figure 2). First, Rossouw outlines the basic human needs that ought to be addressed when working with clients. The need for safety is regarded as a primary need that plays the major role in the facilitation of motivational schemata. 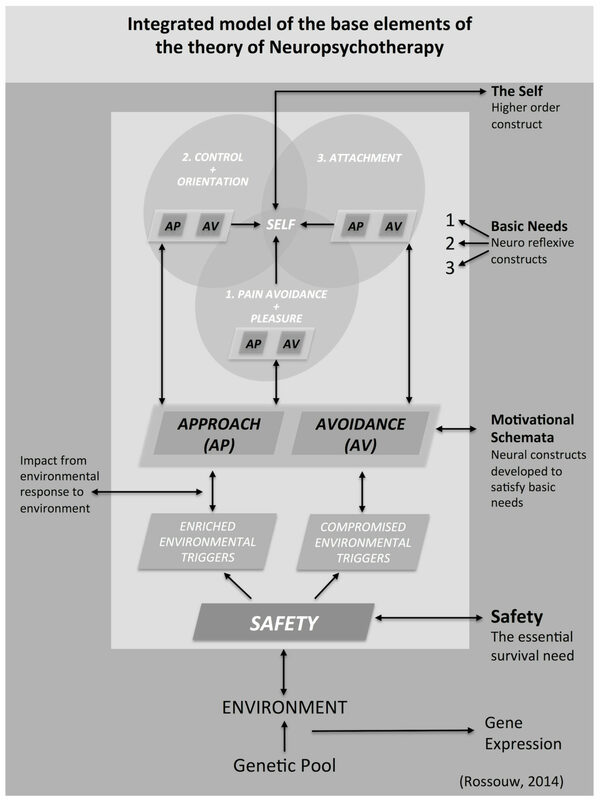 This idea stems from the key neural principle – the principle of survival (the brain changes to enhance survival), where safety “holds the key” (Rossouw, 2014, p. 55) to the facilitation of neural proliferation and approach motivational schemas, while compromised safety leads to neural protection and avoidance. Therefore, the facilitation of safety in the process of neuropsychotherapy helps clients experience controllable incongruence as well as master approach motivational schemas. The basic need for safety is activated through the need for control, the need for distress and pain avoidance and pleasure maximisation, as well as the need for attachment. 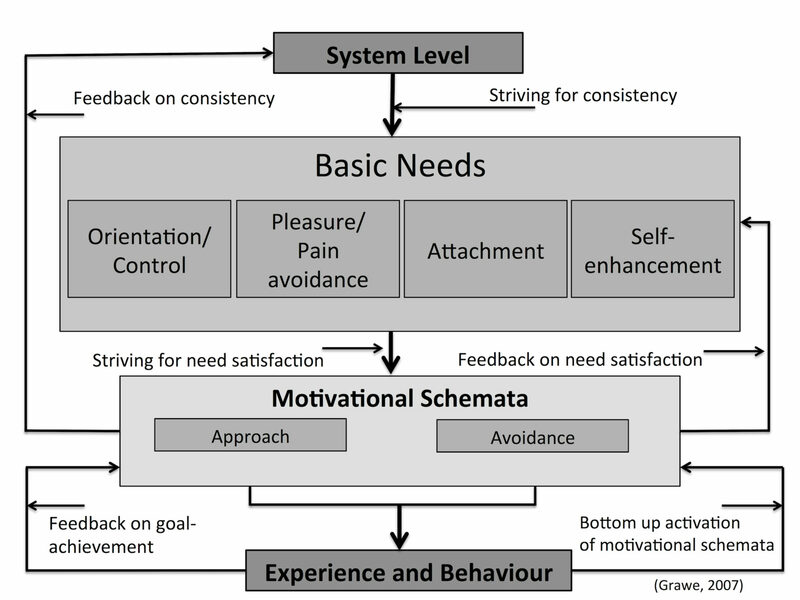 Unlike Grawe’s conceptualisations, in the integrated model the concept of self (and self-esteem) represents a higher order construct that results from neural patterns related to the primary needs and can be identified only in regards to the development of basic needs and their exposure to enriched or compromised environments. Thus, in the integrated neuropsychotherapeutic framework, self is a higher order construct that results in the culmination of the basic needs. In a nutshell, the integrated theory of neuropsychotherapy incorporates genetic influences to which a person is exposed to in the environment – impacts, which result in varied genetic expressions. Either safe (enriched) environments or challenging (compromised) environments lead to the activation of incongruence as the basis of change, life, survival, and thriving. The experience of controllable incongruence results in addressing all three basic needs through patterns of approach. This, in turn, down-regulates the stress response and its activation as well as facilitates neural proliferation, pre-frontal cortical activity and shifts in cortical blood flow to frontal regions. In cases of compromised safety, the stress response system is activated, eventually resulting in increased production of stress hormones and impaired activation of frontal lobes. In such cases, the neural activation of survival initiates the onset of patterns of avoidance. This short-term enhancement of survival can compromise thriving in the long-term, leading to the onset of psychopathology. Rossouw (2014) postulates that fear based neural activation when it become the default activation pattern leads to psychopathology developing from the bottom to the top. Rossouw (2014) describes particular principles of bottom up neuropsychotherapy derived from the outlined theoretical framework, which are also supported by a number of case studies presented in the book. 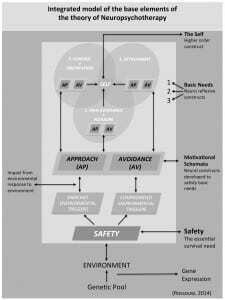 The major trajectory of neuropsychotherapeutic work implies the priority of facilitating safety experiences (on physical and emotional levels) for clients, through down-regulation of their stress responses by means of the Rogerian principles (Rodgers, 1961) and thereby addressing basic human needs. Here the robust therapeutic alliance ensures “integrative relationships” between neuropsychotherapist and clients, “in which differences are respected and compassionate connections are cultivated” (Rossouw, 2014, p. 62). It is only after appropriately pacing treatment and the establishment of a safe environment for clients, a neuropsychotherapist can proceed to uncover the experiences of violation of needs and facilitation of new narratives. Rossouw underlines that one of the key features of neuropsychotherapy is the need to facilitate cortical capacity rather than assuming it. This facilitation is achieved by ongoing therapeutic support and continues activation of new healthy neural networks, supported by advanced mirror neural networks involving the neural principles of Donald Hebb and Michael Merzenich (Kandel, 2005). Present-day authors define neuropsychotherapy as a field of applied research which tries to: identify neural mediators and functional targets of psychotherapeutic effects, to determine new therapeutic routes using neurotechnology, and to design psychotherapeutic interventions on the basis of neuroscientific knowledge (author’s emphasis) (Walter et al., 2009). The main trajectory of the field is seen in its potential to provide investigators with “reliable surrogate markers” (Walter et al., 2009, p. S180) or clinical indicators of causal factors for the development of mental disorders, useful for diagnosis, prognosis and prediction of psychotherapeutic changes. This course becomes possible with the integration of neuroscience into psychotherapeutic education, research and practice. With regard to identification of the neural mediators and functional targets of psychotherapeutic effects, the most clearly marked examples refer to the research on the neural substrate underlying dysfunctional emotional regulation (Beauregard et al., 2001; Davidson et al., 2000; Grawe, 2007; Ochsner et al., 2004; Rossouw, 2012; Walter et al., 2009). Even though anxiety and depression are functionally different (Grawe, 2007), the targets of possible psychotherapeutic work with these mental conditions in some or other way involve similar brain structures. Generally speaking, these structures might include the amygdala, the ventromedial and dorsolateral prefrontal cortices (PFC), related to avoidance mechanisms and negative emotions; and the anterior cingulate cortex (ACC), responsible for transformation of emotions into defined feelings as well as for attention and action. Most importantly, researchers argue that this area of neuropsychotherapy underlines the importance of neuroimaging for tracing mechanisms which would not be apparent while using behavioural methods, for example, the sustained regulatory effect on amygdala activation (Walter et al., 2009). Here the advance of neuroimaging methodologically associates brain processes with the mediators of psychotherapeutic effects. Further, it is recognised that the understanding of mind and brain interrelations can be beneficial for clients themselves, building their motivation to change, as well as gaining deeper understanding of their conditions (Walter et al., 2009). The second area of contemporary neuropsychotherapy is concerned with determination of new therapeutic routes with the usage of neurotechology, which researchers find most remarkable in at least two domains. The first refers to the neurobiological applications of the psychotropic drugs as well as natural neurotransmitters that can impact psychotherapeutic interventions (Grawe, 2007). For example, several researchers have focussed on the function of oxytocin in psychotherapy as it serves as a neuropeptide which proves to have a calming effect on the separation-anxiety system (Rossouw, 2011). Oxytocin was shown to increase trust and mentalising competency of the individuals (Domes et al., 2007), while playing a major role in attachment, which is so important for “the developmental path of a well individual” (Rossouw, 2011, p. 5). Another example comes from the use of drugs that can influence receptors important for the processes of learning and extinction, which in combination with cognitive-behavioural therapy proves to be effective, especially for social anxiety disorder (Hofmann et al., 2006). Another domain for determination of possible therapeutic routes becomes possible with the help of functional neuroimaging procedures and the usage of neuro-feedback as the process whereby clients can learn to self-regulate their brain activity (Linden, 2006; Masterpasqua & Healey, 2003). Thus, for example, transcranial magnetic stimulation (TMS), functional magnetic resonance imaging (fMRI) and neuro-feedback prove to be beneficial for wide range of issues: symptoms of obsessive-compulsive disorder (OCD), drug-resistant hallucinations, disrupted perception of pain, attention deficit/hyperactivity disorder (ADHD), as well as schizophrenia and depression (DeCharms, 2008; Masterpasqua & Healey, 2003; Schonfeldt-Lecuona et al., 2003). The third area of the contemporary neuropsychotherapeutic application is seen in designing psychotherapeutic techniques on the basis of the neuroscientific knowledge. Here the author points out such innovative therapeutic processes as eye movement desensitisation and reprocessing (EMDR) and re-consolidation of memory traces, particularly for clients experiencing post-traumatic stress disorder (PTSD) (Jeffries & Davis, 2012; Nader & Hardt, 2009; Shapiro, 1996). In this vein, the evidence in favour of eye movement bilateral stimulation as an essential component of EMDR, suggests that it firstly increases the access to episodic memories and then it acts upon components of working memory (Jeffries & Davis, 2012). This progression helps psychotherapists find the best way to awake and re-integrate traumatic memories, which makes client focus on the traumatic memories less unpleasant and, therefore, allows easier access to these memories. The outlined contemporary neuropsychotherapy frequently views major mental disturbances as “network disorders” (Walter et al., 2009, p. S176), which suggests a pathologic functional connectivity or a “neurofunctional mode” (i.e., “a dysfunction of a distinct neural network”), as the underlying process for any given mental condition. For example, cortico-limbic dysregulation is seen to account for depressive symptoms, rather that previously supported interaction of increased bottom-up emotional reactivity and decreased top-down PFC regulation of emotion (Brooks et al., 2009). Additionally, the changes in PFC activation through psychotherapy and pharmacological treatment are currently linked to the differentiation of tonic or resting-state activation and event-related responses, not merely decreases of bottom-up and increases of top-down regulation (Walter et al., 2009). Modern-day Russian psychology has its roots in the 1920s when the remarkable group of Soviet researchers, “the Russian troika” (Rossouw & Kostyanaya, 2014) – lead by Lev Vygotsky, started a thorough examination of broad psychological phenomena. The general line of their research inquiry was manifested by the ambitious desire of young Alexander Luria to take part in “the creation of an objective approach to behaviour that concentrated on real-life events” (Luria, 1979, p. 25). Both due to the peculiar state of global psychology as a scientific discipline of that time and to socio-historical context of the ‘motherland’, Vygotsky and his colleagues seemed to have a clear view on what should be studied. According to Luria and Alexei Leontiev, at that time they aimed to establish the materialistic study of human mental activity (Homskaya, 2001). For better understanding, it is important to mention that these researchers tried to define themselves somewhere in between the “idealistic” and “naturalistic” approaches to human processes with particular attention to the main postulates of the philosophy of Marxism. Several core research themes can be identified in the mutual works of the troika, while particular interests of each of the researchers are presented in the following paragraphs. Soviet psychologists were primarily concerned with the problem of consciousness or, in other worlds, with understanding what constitutes the psychology of human beings and how they are different from other species (Homskaya, 2010). Thus, the Russian troika devoted its primary attention to the cultural and historical development of higher mental functions via mediation processes of speech and mnemotechnics as specific outcomes of the cultural development of society. To explain mediation processes, Vygotsky put forward the notion of “a sign”, emphasising that human mental processes are mediated by the tools which have “meanings” and not just cognitive meanings, but also psychological (Vygotsky, 1999). The second major idea of soviet psychological framework is that the activity of a person in altering his or her environment plays a crucial role in the process of mediation of higher mental functions and mastering specific human behaviour (Homskaya, 2010). As a result, consciousness is referred to as a specific human form of reflection, which is created by external conditions and complex social forms of practical activity. Further, the research group devoted its inquiry to the main principles of the development of the human mind or the study of the systemic and dynamic structure of mind/consciousness (Homskaya, 2010). The core principle of the study suggested that the structure of specific human mental processes is formed through the external activity of a person and can be internalised further during the lifespan of a person. Another important principle is that consciousness is characterised by systemic structure and all higher mental functions are related to each other. Therefore, in order to understand a singular function one should analyse the system as a whole (Luria, 1973; Vygotsky, 1978). Importantly, the “progressive” significance of Vygotsky’s postulates recognised by his disciples is seen in the “dynamic” vision of human mental processes: the functions themselves occur in the process of child mental development and change their interconnectedness due to their transition to more complex forms of mental activity (Homskaya, 2010). The study of the concept of “meaning” was among the latest collaborative research attempts of the troika (Homskaya, 2010). Soviet investigators were particularly interested in its origins and development in cultural, social and psychological contexts (Gredler & Shields, 2008). Researchers stated that “meaning” finds its representation in a word and mediates the process of immediate sensuous reflection of the world (Homskaya, 2010). The word here is seen as being inseparable form the meaning and vice versa. In order to examine the psychological meaning one should examine the word in its function of generalisation process, which was reflected in troika’s studies of the formation of notions (concepts) among children (Homskaya, 2010). While promoting and supporting the outlined general postulates of soviet psychological framework, each of the researchers concentrated on a particular aspect of the framework, and in accordance with their individual interests: Luria (1973) was generally concerned with cerebral organisation of mental functions, Vygotsky (1978) was primarily focused of socio-cultural aspects of human functioning and Leontiev (1979a) further introduced his own theory of activity. Alexander Luria was the founder of Russian neuropsychology who based his studies on the above-mentioned general psychological framework of the Russian troika and came up with the unique considerations in the area of brain and mind interaction (Kostyanaya & Rossouw, 2013; Rossouw & Kostyanaya, 2014). In Russian domain of neuropsychology is seen as a field that emerged in between psychology, medicine and physiology, where the central theme was represented by the study of cerebral organisation (localisation) of mental functions (Homskaya, 2010). Homskaya (2010) notes that the three following questions were of particular interest for Luria and determined his investigation into human mind and brain interaction: 1) What constitutes a mental function as a psychological phenomenon? 2) What constitutes the brain as the substrate for mental functions or what are the main principles of its organisation? 3) How can mental functions be associated with brain structures? As a result of combining Luria’s queries with those of Vygotsky and Leontiev, the highest human mental function in Soviet psychology was recognised as a complicated form (configuration) of mental activity, comprising; driving motives, goals (programme), executional elements (actions and operations), and control mechanisms (Homskaya, 2010). Also, the researchers underlined that higher mental functions take up the supreme position as they arise during one’s lifetime, are mediated by psychological tools and voluntarily controlled. It is worth noting that it was Luria who in the early 1920s began his thorough investigation in the areas of philosophy, psychology and medicine at Kazan University, which later allowed him to attract Vygotsy and Leontiev in Moscow and set up the Russian troika (Kostyanaya & Rossouw, 2013). Those years were the time of a totalitarian regime in Soviet Russia as well as political repression, lack of freedom, isolation from the world scientific communities and propogandisingand politisation of the social sciences (Gindis, 1991; Sokolova, 2005). The historical turmoil of these times disrupted research in many ways, preventing investigators studying diverse areas of their interests because of thorough scrutiny and political censorship. Therefore, Luria himself as well as his colleagues and disciples mention that his scientific progression was “somewhat incoherent” (Kostyanaya & Rossouw, 2013, p. 48), however, several core themes can be identified throughout his career . Interestingly enough, some historical accounts of Soviet psychology question whether the scientific achievements which emerged should be initially credited to Marxist-Leninist methodology, or rather if they emerged in spite of this ideological pressure (Gindis, 1991; Lomov, 1984). Thus, the beginning of the 1920s in the Soviet Union was marked by the troika’s research in the area of “pedology” or “the integrative science of a child as a whole entity” (as cited in Gindis, 1991, p. 169). The researchers were driven by the ideas of the plasticity of human nature, the power of social conditioning and the capability of scientific methods. These ideas as well as the troika’s emphasis of qualitative methods and individual differences in children, were criticised by the authorities and recognised as harmful for the “social state” (Gindis, 1991, p. 170). However, as Gindis states, “a science has its own logic of development and intellectual activity cannot be reduced simply to reaction to political environment” (p. 170). In this vein, the initial postulates about human capacities and the plasticity of human nature were further incorporated by Luria in his research on analysis and restoration of human mental functions (Luria, 1963, 1966, 1973, 1976, 1979). Before meeting Vygotsky at the Second Psychoneurological Congress in Leningrad, Luria had already began his well-known collaborative work with Leontiev on the combined motor method, which led to the development of the first lie detector in the Soviet criminal justice system (Kostyanaya & Rossouw, 2013). This first investigation in complex human behaviour through the analysis of the influence of affective reactions on motor reactions was followed by Luria’s research on the planning and regulating role of speech as well as on aphasia and abnormal ontogenetic development in children (Glozman, 2007). In the years of troika’s collaborative work Luria both managed to contribute to the development of the cultural-historical approach to psychology and pursue his own interests (Kostyanaya & Rossouw, 2013). He engaged in numerous studies on the role of heredity and external factors in mental processes (Luria, 1979), on the localisation and restoration of cerebral impairments and related functions, which was eventually described in one of his major works, The Working Brain: An Introduction to Neuropsychology (Luria, 1973). Among the most significant of Luria’s concepts that he introduced during the post-war period is that of the three principal functional units of the brain responsible for human mental processes and conscious activity (1973): the unit for regulating tone and waking; the unit for obtaining, processing, and storing information, and the unit for programming, regulation and verifying of mental activity. He claimed that those units possess hierarchical structure comprising three cortical zones: the primary (projection) area; the secondary (projection-association) area, and the tertiary areas (zones of overlapping). In his neuroscientific analysis Luria underlined that human mental processes represent complex functional systems that involved groups of brain areas working in collaboration (Kostyanaya & Rossouw, 2013). During the last years of Luria’s career and life he concentrated on a new approach to the structure of memory processes, new areas of neuropsychology (i.e., neurolinguistics) and the study of the interrelationship between brain hemispheres (Kuzovleva & Das, 1999). His theoretical ideas found their practical application in Luria’s unique clinical approach to the development, application and interpretation of neurospsychological assessment (Ardila, 1992; Lewis et al., 1993). Lev Vygotsky is one of the most recognised Russian psychologists, who’s works have been translated into many languages, have been applied in diverse cultural settings and have significantly influenced developmental psychology around the world (Gallagher, 1999; Gredler & Shields, 2008; Homskaya, 2010; Karpov & Haywood, 1998; Kostyanaya & Rossouw, 2013; Louis, 2009). He managed to leave behind about two hundred and seventy scientific works, when in 1934 at the age of thirty-seven he died of tuberculosis, which not easily curable at that time in Russia (Gallagher, 1999). Among the most obvious factors, which influenced Vygotsky’s trajectory of work and, in particular, his development of cultural-historical theory, Gredler & Shields (2008) found that the socio-historical context of the Soviet Socialist Republic, influenced his talents and methods of scientific analysis. Vygotsky’s early childhood interests in history, art, literature, and theatre were among the precursors of his future scientific advances, the first of which was his thesis on Shakespeare’s tragedy of Hamlet, recognised by many leading scholars in the field and followed by his studies in the psychology of art (Bayanova, 2013). After his glorious presentation in 1924 on “Methods of Reflexological and Psychological Investigation” at the Second All-Union Psychoneurological Congress held in Leningrad, Vygotsky joined Luria and Leontiev at the Moscow Institute of Experimental Psychology. This time is recognised by his colleagues as “the turning points” in their careers (Luria, 1979), as it was the start of many fruitful research pathways for Russian psychological science. In the following years of continuous battles with tuberculosis, Vygotsky managed to defend his dissertation on “The Psychology of Art”, write an outstanding methodological essay on the “Historical Meaning of Crisis in Psychology” as well as his major works in the fields of education, abnormal psychology and cultural-historical approach to psychology: “Pedagogical Psychology”, “Thought and Speech”, “History of the Development of Higher Psychological Functions”, and “Problems of Mental Retardation” (Vygotsky’s theory, 2010). In 1926, after finishing his degree in medical training, Vygotsky established the laboratory for studies in psychology of abnormal children, which later became the Experimental Institute of Defectology (Vygotskaya, 1999). At that time various professionals from related fields as well as parents and relatives of suffering children would attend Vygotsky’s case presentations and his consultations. Vygotsky is well-known for his major account of the cultural-historical theory of mental development, which has been scattered across his numerous works and implemented in diverse domains, primarily in the studies on child normal and abnormal development (Gallagher, 1999; Gredler & Shields, 2008). Being driven by Marxist theory as well as by an objective approach to psychology, Vygotsky saw the main subject of psychological science in the study of consciousness (Homskaya, 2010). His robust theoretical considerations nevertheless allowed Vygotsky highly develop his theory which was applied both in educational and clinical areas of practice (Gredler & Shields, 2008; Homskaya, 2010). When analysing human development as well as the development of any given individual, Vygotsky came to the major conclusion that human ontogenesis is determined by both natural (organic maturation) and cultural developmental plans (Homskaya, 2010). According to Vygotsky, it is exactly in the process of the historical development of social human beings that changes the means of mastering their behaviour and develops human beings unique, higher and cultural forms (Homskaya, 2010). In case of applying the theory to the development of a child, Vygotsy postulated that social interaction takes the major role in continuous changes in children’s thoughts and patterns of behaviour, which can be quite complex in diverse cultures (Gallagher, 1999). Vygotsky proposes that developmental processes rely on the cultural tools which can be passed from individual to individual in three main ways: through imitative learning, instructed learning, and collaborative learning (Gallagher, 1999). The psychological tools Vygotsky defined as “intellectual mechanisms or operations which we use to examine our environment and interact with others” (Louis, 2009, p. 20). Among the most profound cultural tools he proposed were, symbols, written and oral language, maps, and the scientific method (Gredler & Shields, 2004). Gallagher (1999) outlines several major principles of Vygotsky’s theory of child cognitive development which also relates to the broader framework he applied to the psychology of human mental functions. Firstly, private speech is used by children for planning and guiding their own behaviour. Most frequently children use private speech when the tasks they are performing become too difficult for them to accomplish without appropriate assistance. As a result, the second principle refers to Vygotsky’s concept of the zone of proximal development (ZPD) or the difference between the actual development level as determined by individual problem solving and the level of potential development as determined while problem solving under adult guidance or in collaboration with more knowledgeable peers (Louis, 2009). Therefore, the success of learning and cognitive development depends on the ability to perform tasks within the individual’s ZPD. Additionally, the learning process that leads development should possess two main features: subjectivity and scaffolding (Gallagher, 1999; Louis, 2009). Subjectivity takes place when during the learning process two individuals begin the task with different understanding and eventually end up with a shared understanding. Scaffolding refers to the change in the assistance of a more knowledgable person from intensive to reduced, while the skills of the learner improve. In addition, Vygotsky claimed that every mental function in the child’s cultural development appear twice: firstly, while in communication with others (interpsychologically) and afterwards inside the child (intrapsychologically), where the acquisition of language plays the most influential role (Vygotsky’s theory, 2010). Generally speaking, the theme of most of Vygotsky’s works refer investigators to the emphasis on the social learning, cultural experiences and inner strengths of a person in developmental processes. Alexei Leontiev is the eminent Russian researcher, who in the 1930s formed the Kharkov school of psychology that focused on the activity approach to psychology, which to the present day remains the main psychological doctrine in Russia (Sokolova, 2005). Several investigators have tried to analyse what impacted the polarisation of Vygotsky’s and Leontiev’s views as well as whether it actually took place upon foundation of the Kharkov school of psychology (Kozulin, 1996; Leontiev, 2005; Sokolova, 2005). The major conceptual contention between the two Russian investigators was described in Leontiev’s “Study of the Environment in the Pedological Works of L.S. Vygotsky” published only in 1998 (Sokolova, 2005). In this work Leontiev for the first time emphasises that the source of psychological development lies in the activity of a subject in the environment, but not solely in the environment. It is important to mention, that Leontiev also shared the most fundamental postulates of the cultural-historical theory initiated by Vygotsky (Sokolova, 2005). In particular, he endorsed Vygotsky’s dialectical removal of the dichotomy between environment and heredity in Western experimental psychology. Leontiev emphasised the necessity to explore “the unity of the subject and his environment” (as cited in Sokolova, 2005, p. 4), however, he also stated that Vygotsky’s concept of experience cannot explain the importance of the relationship “that personality enters the reality that surrounds it”. Instead, he offers the category of “meaning”, which within the context of activity transforms any socio-historical fact of a subject into a psychological one (Sokolova, 2005). When analysing and comparing the most prominent Soviet psychological developments, some authors tend to reflect on the socio-political impact of the times when both Vygotsky’s and Leontiev’s theories happened to emerge (Kozulin, 1996). Thus, when acknowledging the mutual sociocultural framework of research of both Vygotsky and Leontiev, Kozulin (1996, p. 328) states that Leontiev was more restricted by “internal censorship” and “outright opportunism” of Marxism, masking his “true thoughts and intensions”. Kozulin (1996, p. 329) writes that the major focus of Leontiev’s works was made on the development of a coherent and robust psychological model where “labor as a paradigmatic human activity becomes a source of psychological development of the individual”. The author concludes that Leontiev’s late focus on the meaning and the motives of human activity was “poorly articulated”, which was indeed later acknowledged by Leontiev’s followers and which has now been thoroughly examined by Russian and foreign psychologists around the world (Baumeister & Vohs, 2002; King & Hicks, 2012; Leontiev, 2005b; 2012; 2013; Reker & Wong, 2012; Schnell, 2009). As a result, Leontiev proposed the psychological examination of human mental processes from the perspective of three different levels of analysis (Rossouw & Kostyanaya, 2014). The highest and most generic level refers to motives that drive human activity. The intermediate level is characterised by actions and their associated goals, and the lowest level is the analysis of operations which can serve as means for achievement of the higher-order goals. In addition, Leontiev was particularly concerned with the activities which can eventually lead to the internalisation of external human actions in the form of inner mental processes (Kozulin, 1996). Together with other members of the Soviet psychological school, Leontiev was involved in diverse experimental studies (Sokolova, 2008), which in turn prompted his unique conceptualisations of fundamental psychological ideas through the lenses of his theory of activity. Thus, with reference to Vygotsky’s analysis of mediation processes, Leontiev studies the formation of memory and attention as higher human mental functions (Leontiev, 1979b). When administering his method of double-stimulation, Leontiev proved Vygotsky’s hypothesis on the development of higher mental functions via the internalisation process of signs/stimuli (Sokolova, 2008). As a result of his studies, Leontiev described the development of memory and attention processes from pre-associative to associative and mediated. It was endorsed by Leontiev that speech plays one of the major roles in the mediation of higher mental functions, while recommendations for future research were made in favour of the analysis of human needs and affects. It is worth to mentioning that among his most prominent concepts was the idea of the “subject-object continuum” or, in other words, understanding the person within the world (Leontiev, 2000) as well as the related conceptualisation of personality “as a type of junction connecting the development of the society and the individual (“subjective development”) (Leontiev, 2005a, p. 46). Leontiev strongly believed that the new psychological dimension should constitute the study of people’s place and position within the system of social connections and communications or the study of what is “innate” in people together with what they “acquire” (Leontiev, 1983). The practical application of Leontiev’s activity theory has been primarily established in the domain of human-computer interaction, in particular, in the interaction design, promoted by the proponents by the computer-supported collaborative work communities in different countries (Kaptelinin & Nardi, 2006). In the previous two parts of this paper the developments of Soviet psychological school and the foundations of a neuropsychotherapeutic framework were discussed. The final part of this paper presents a critical reflection on what is similar between the two paradigms and what allows their theoretical comparison, how they differ, and what are the future perspectives in terms of their mutual impact. It is worthy to note that the comparison of these particular areas of knowledge is not found in any of the relevant literature and thus constitutes the novelty and the significance of this analysis. When taking into account the levels of methodology of scientific knowledge offered by contemporary Russian personality psychologist Asmolov (1990), several core points of similarity between the two paradigms become evident. At the highest level of methodology or, in other words, when comparing the philosophy or the world view of the investigators of both paradigms, it is clear that the major goal of past and present investigators was to understand the “human condition” (Rossouw, 2014) via creation of robust explanatory models. For Luria and his colleagues (Luria, 1979) the Soviet regime was the time to fulfil the “primary ambitions” of becoming psychologists and taking part in the “creation of an objective approach to behaviour that concentrated on real-life events” (as cited in Kostyanaya & Rossouw, 2013). In addition, it was precisely the problem of consciousness and the following interaction between the mind and brain which were of the most importance for Soviet psychologists (Homskaya, 2010). By the same token, the major goal of one of the founders of neuropsychotherapy – Klaus Grawe – was in the formulation of a “grand theory of psychopathology and psychotherapy” (Grawe, 2007, p. xxi), which takes “patients’ experience seriously on all levels”. Here, Grawe (2007) also emphasises that his major interest is in the neuroscientific explanations for an “integrative” or “generic” psychotherapeutic framework based on his consistency-theoretical model of mental functioning. However, the principle difference between the two paradigms emerge around the highest level of methodology. In line with Western experimental psychology of the 19th and 20th centuries, Soviet investigators were mostly concerned with explaining general psychological principles of mental functioning (Fancher, 2006; James, 1981; Luria, 1932; Titchener, 1902; Vygotsky, 1978, 1987). Moreover, as mentioned in previous sections, the main attention of their work was given to the impact of society and culture in general on the development of higher mental functions which were claimed to differentiate human beings from other species (Vygotsky, 1978). It was predominantly during the World War II and its aftermath with the treatment and rehabilitation of veterans, when the Soviet school of psychology shifted from pure theory to its practical applications (Homskaya, 2010; Luria, 1979). Additionally, during the last years of the Soviet era, Russian psychologists started to became more and more interested in the problem of personality, therefore, referring to the role of context and internalisation of meaning in human functioning; and started to see the future of psychology in the thorough analysis of idiosyncratic psychological phenomena rather than of generic phenomena (Homskaya, 2010; Leontiev, 2000). By contrast, the proponents of a neuropsychotherapeutic framework emphasise that neuropsychotherapy refers to a “neuroscientific perspective on the problems of psychotherapy” (Grawe, 2007, p. 14) as well as to the “practical implications that emerge from this perspective”. According to Rossouw (2014, p. 3), neuropsychotherapy aims to “understand the pathogenesis of wellness as well as the pathogenesis of psychopathology”, to allow practitioners to better understand how they can restructure the brain towards “higher levels of functioning and well-being” (Rossouw, 2011). Therefore, despite being initiated by the very similar goal of creating a generic explanatory model of human functioning, the Soviet school of psychology can be characterised as predominantly theoretical and meeting the requirements of classical scientific psychology, while neuropsychotherapy is a specifically applied area of knowledge (Rossouw, 2014; Walter et al., 2009). When, referring to the next two levels of methodology (Asmolov, 1990), the general and concrete principles/methods of scientific inquiry, one can also find various corresponding concepts introduced in both paradigms of concern. Interestingly enough, the unique ideas of each of the members of the Russian troika (Kostyanaya & Rossouw, 2014) can be directly or indirectly traced in the consistency-theoretical model of mental functioning and its therapeutic implications suggested by Grawe (2007). For instance, Leontiev’s (2000) argument on the premiere role of activity, and related motives, goals, and actions as well as general active stance of a person in changing environments which contributes to the understanding of human demential functioning,corresponds remarkably with the notion of approach and avoidance motivational schemas in Grawe’s model (2007). Thus, in parallel to Leontiev’s (1979) emphasis on human motivation as the driving force of activity, Grawe (2007, p. 348) states that “congruence and consistency refer to the motivated aspects of mental functioning” and that in order for therapy to be effective, the neuropsychotherapist should question “the factors that move a person, both positively and negatively” (2007, p. 164). The fundamental assumption of the neuropsychotherapeutic framework is that the therapeutic outcome depends on “the extent to which the therapy manages to achieve consistency improvements in the patient’s mental functioning” (Grawe, 2007, p. 353). It is also recognised that the improvement of consistency can be achieved: via disorder-oriented treatment, experiences in the therapy process and the treatment of individual sources of incongruence (Grawe, 2007, p. 353)). The onset of psychopathology as well as the frequently presenting “anxious brain” in clients is seen to emerge as a result of compromised or violated basic needs and following “protective action” of avoidance motivational schemas (Rossouw, 2014, p. 16). Clients in these psychopathological conditions need “an expert outside perspective”, while “getting outside help” also refers to “influencing one’s neural structures via someone with other neural structures” (Grawe, 2007, p. 355). Here the author indirectly mentions not only the significance of mirror neurones as possible mediators of the neuropsychotherapeutic interventions (Rossouw, 2010), but also refers to “challenging incongruence situations” as a mean for clients’ mastery of behaviour and experiences (Grawe, 2007, p. 222). In other words, “the motor of metal development” and following enhancement of clients’ well-being is seen in controllable incongruence, which can be reached when the individuals are confronted with situations that can be potentially achieved; when one develops “potentials beyond the currently attained level” (Grawe, 2007, p. 222). Those fundamental neuropsychotherapeutic conditions that aim to enhance clients’ well-being can be compared with the conditions for the development of the higher mental functions and cognitive development of human beings in general, postulated more than half a century ago by Vygotsky (Louis, 2009). According to Vygotsky, effective learning and cognitive development can only occur when a learner is confronted with a task that seats within his or her zone of proximal development (see Russian psychology part). The effectiveness of a person’s cognitive development also depends on the possibility of scaffolding, where the assistance of a more knowledgeable person decreases according to the continuous mastery of the learner’s skills. In that sense, neuropsychotherapy can be metaphorically related to the formation of new higher mental functions of the client that are determined by their needs and baseline capabilities. Both paradigms pay particular attention to the strengths of clients, which neuropsychotherapy and cognitive development (in the case of Vygotsky) are built upon (Grawe, 2007; Homskaya, 2010). The unique ideas of Luria in regards to mind and brain interactions have most similarity to the neuropsychotherapeutic views on the importance of neuroscience for psychotherapeutic practice. Thus, Kostyanaya & Rossouw (2013) state that Luria’s description of the bottom-up development of the brain (Luria, 1973) is very similar to neural research implemented by Paul MacLean (1990) and his conceptualisation of the triune brain. The understanding of fundamental neuroscientific processes is essential for practitioners when implementing theory in practice, which has been reiterated by major investigators in the field (see, for example Grawe, 2007; Kandel, 1998; Rossouw, 2014). Rossouw (2014, p. 8) underlines that the emerging paradigm of mental health care focuses on linking the bottom-up and top-down approaches, where “the key feature of neuropsychotherapy – the need to facilitate cortical capacity rather than assuming cortical capacity”. By the same token, Luria developed a specific series of tests and tasks for restoration and correction of compromised mental functions in his patients, primarily based on his conceptualisation of the three principle functional units of the brain (Luria, 1973; Purisch & Sbordone, 1986). Similar to most of the proponents of neuropsychotherapy (Rossouw, 2014), Luria believed in the flexibility of the substrate and the ability of compensative mechanisms to take place when appropriate neuropsychological assistance is available for those suffering psychological incapacity (Luria, 1973). The main difference on the level of concrete principles and methods between Soviet psychological developments and those of neuropsychotherapy comes from the present-day availability of such technological tools as neuroimaging (Walter et al., 2009). While foreshadowing the “beginning of a new intellectual framework”, (Kandel, 1998, p. 457), psychiatrists have envisioned gaining knowledge in different ways, but those of the troika were “fully comparable to that of a well-trained neurologist” (p. 466). Research shows that neuroscientific knowledge is indeed incorporated into current treatment practice [see for example eye movement desensitisation and reprocessing in therapy for post-traumatic stress disorder (Raboni et al., 2006)]. Rossouw (2014, p. 7) argues that neuropsychotherapy focuses on “the neural basis for understanding the human condition” and that allied neuroscientific fields contribute to psychotherapeutic theory and practice in multiple ways. For instance, the latest knowledge on gene expression, on fundamental neural principles (see, for example research by Donald Hebb and Michael Merzenich), as well as developments in epigenetics that underlines the role of environment for brain functioning allow changes in clients at the “neuro-structural, neurochemical and neural network levels” (Rossouw 2004, p. 7). The Soviet school of psychology was primarily concerned with another level of analysis of human functioning, pertaining to general psychological principles and with the emphasis on the role of social interaction (Homskaya, 2010). Therefore, when looking at the two paradigms from the perspective of biopsychosocial-spiritual approach to human functioning (Greenberg, 2007), each of the paradigms have their main focus of inquiry, as aiming to be all-encompassing. The two analysed paradigms significantly differ on the last level of methodology, i.e., the level of methods and techniques of inquiry (Asmolov, 1990). The neuropsychotherapeutic framework allows the therapist to use techniques of whichever therapeutic stance, as long as she addressees clients’ needs and the outlined above therapeutic strategies (Grawe, 2007). Grawe also offered and successfully tested a particular questionnaire, the Inventory of Approach and Avoidance Motivation, which can help a neuropsychotherapist to identify clients’ motivational goals, “particularly pertinent in the context of psychotherapy” (Grawe, 2007, p. 259). With regard to the Soviet school, the most pronounced series of specific psychological techniques was offered by Luria (Purisch & Sbordone, 1986). The distinctive feature of the Luria-Nebraska neuropsychological test is that it is useful for a wide range of issues that addresses diverse psychological conditions and has proven to be effective in different cultures (Purisch & Sbordone, 1986). However, here again the main focus is on the most fundamental psychological processes and their distortions, relating to the domain of neuropsychology. The above comparative analysis of the neuropsychotherapeutic framework and Soviet elaborations in psychology allows us to mark how the two paradigms could mutually contribute to each other’s trajectories of future development and enhancement. Two major directions for future consideration become apparent at this stage of the analysis, each of which has also been acknowledged by some researchers in the related fields in their individual works (Gindis, 1991; Rossouw, 2014). Thus, Rossouw (2014) argues that contemporary neuropsychotherapy focuses both on neurobiology and interpersonal interactions which are the essential markers of pathology and wellness and which creates the neuroscience of the “interconnectedness of us”. Here the focus is given to the role of the society in shaping human functioning, which also was mentioned by Grawe (2007) when underlining the necessity of the analysis of clients’s needs in their contexts and specific environments. This trajectory for future neuroscientific consideration could draw upon more thorough analysis of the fundamental Soviet psychological principles of the formation of human mental functions. The concept of mediation (Karpov & Haywood, 1998) and the principles of the creation of personal meaning (Leontiev, 2012; 2013), dependant on cultural and individual contexts, could better inform professionals about inner worlds of their clients. Also, certain concepts (yet to be thoroughly analysed) could shed more light on the psychological processes of mental conditions. For example, the concept of shifting motives onto goals introduced by Leontiev (2006) could be used as an explanatory concept for the understanding of the mechanisms of addictive behaviours. Therefore, Soviet psychology could serve as the additional theoretical source for a neuropsychotherapeutic framework, if further more thorough analysis of the known and not so well known concepts is undertaken. By contrast, starting from Leontiev’s proposition of the necessity to analyse personality and its features (Homskaya, 2010), it has been further noted that Soviet and later Russian psychological schools need to divert attention from purely theoretical to more practical problems in order to make psychology more applicable to the needs of the society (Gindis, 1991). In 1989 it was noted that in the USSR there were about 5000 psychologists, 12 universities and two pedagogical institutes where psychologists could achieve highly recognised academic degrees (Gindis, 1991). By 2005 there were already 400 universities across the country, with 5000 psychology graduates each year (Sokolova, 2005). It was the time of “perestroika” (or rearrangement, structural adjustment), when the first private practices in psychology started to emerge with less stigma for clients asking for psychological support and help (Sokolova, 2005). However, as it was noted in the past by Gindis (1991) and can be confirmed by the experience of the author of this paper, most of the psychology graduates in Russia are still trained predominantly as academic researchers, rather than practitioners. Also, in line with previous claims about the lack of availability of foreign psychological literature and corresponding scientific communication in Russia (Tulviste, 1988), it can be stated that there are still a lot of hindrances for Russian psychological schools to duly perform on a global scale. Therefore, the above comparative analysis of the two paradigms suggests that while having very similar theoretical assumptions with the Soviet school, a neuropsychotherapeutic framework could be further modified and incorporated into Russian psychological practice, where robust psychotherapeutic approaches are in extremely high demand (Gindis, 1991). Additionally, current conceptualisations of psychotherapeutic processes (explained with reference to mirror neural networks and epigenetics) could serve as robust theoretical ground, the development of which has always been in best interests of the Russian school of psychology. According to a famous Russian proverb, “Everything new is well-forgotten old” or translated into English “There is nothing new under the sun” . Therefore, in the current time of the “dawn of the mental health renaissance” (Rossouw, 2011, p. 3), this paper aimed to build a bridge between uncovered Soviet developments in psychology and present neuropsychotherapeutic considerations. Both paradigms have been discussed with a particular focus on their origins and corresponding scientific and societal demands. The first part of the paper focused on the consistency-theoretical model of mental functioning offered by Klaus Grawe (2007) and most recent conceptualisations of neuropsychotherapy as a research field (Walter et al., 2009). The second part outlined the main psychological developments of the Russian troika (Rossouw & Kostyanaya, 2014), and in particular the major contributions of Alexander Luria, Lev Vygotsky, and Alexei Leontiev to the field of psychology in the Soviet Union and later Russia. In the third part of this paper the major similarities and differences between the two approaches were analysed in accordance with the four levels of scientific methodology suggested by Asmolov (1990). Future considerations in relation to how the two approaches could further contribute to each others’ development have also been discussed. Akhutina, T. V. (2003). L.S. Vygotsky and A.R. Luria: Foundations of Neuropsychology. Journal of Russian and East European Psychology, 41, 159-190. Akhutina, T. V., & Pylaeva, N. M. (2012). Overcoming learning disabilities. A Vygotskian-Lurian neuropsychological approach. Cambridge University Press. Ardila, A. (1992). Luria’s approach to neuropsychological assessment. International Journal of Neuroscience, 66, 35-43. Bayanova, L. F. (2013). Vygotsky’s Hamlet: the dialectic method and personality psychology. Psychology in Russia: State of Art, 6(1), 35-42. Baumeister, R. F., & Vohs, K. D. (2002). The pursuit of meaningfulness in life. In C. R. Snyder & S. J. Lopez (Eds. ), Handbook of positive psychology (pp. 608–618). Oxford: Oxford University Press. Beauregard, M., Levesque, J., & Bourgouin, P. (2001). Neural correlates of conscious self-regulation of emotion. The Journal of Neuroscience, 21, RC165. Brooks J.O. 3d, Hoblyn, J., Woodard, S., Rosen, A., & Ketter, T. (2009). Corticolimbic metabolic dysregulation in euthymic older adults with bipolar disorder. Journal of Psychiatric Research, 43(5), 497-502. Cozolino, L. (2002). The neuroscience of psychotherapy. New York: Norton. Davidson R.J., Putnam K.M., & Larson C.L. (2000). Dysfunction in the neural circuitry of emotion regulation: a possible prelude to violence. Science, 289, 591–594. DeCharms, R. C. (2008). Applications of real-time fMRI. Nature Reviews Neuroscience, 9, 720-729. Domes, G., Heinrichs, M., Michel, A., Berger, C., & Herpertz, D. C. (2007). Oxytocin improves “mind-reading” in humans. Biological Psychiatry, 61, 731-733. Draguns, J. G. (2007). Review of neuropsychotherapy: how the neurosciences inform effective psychotherapy and neuropsychotherapie (neuropsychotherapy). Psychotherapy (Chic)., 44(1), 118-120. Epstein, S. (2003). Cognitive-experiential self-theory: An integrative, psychodynamic theory of personality. In T. Millon & M. J. Lerner (Eds. ),Comprehensive handbook of psychology, Vol. 5: Personality and Social Psychology (pp. 159-185). John Wiley & Sons, Inc.
Epstein, S., Lipson, A., Holstein, C., & Huh, E. (1992). Irrational reactions to negative outcomes: Evidence for two conceptual systems. Journal of Personality and Social Psychology, 62, 328–339. Eysenck, H. J. (1952). The effects of psychotherapy: An evaluation. Journal of Consulting Psychology, 16, 319–324. Freud, S. (1895). Project for a Scientific Psychology. In Bonaparte, M., Freud, A., Kris, E. (Eds.) The Origins of Psycho-Analysis. London. Gindis, B. (1991). Remembering the future: contemporary school psychology in the Soviet Union. School Psychology International, 12, 165-180. Glozman, J. M. (2007). A. R. Luria and the history of Russian neuropsychology. Journal of the History of Neurosciences: Basic and Clinical Perspectives, 16, 168-180. Grawe, K. (2007). Neuropsychotherapy. How the neurosciences inform effective psychotherapy. New York, NY: Taylor & Francis Group. Gredler, M. E., & Shields, C. C. (2004). Does no one read Vygotsky’s words? Commentary on Glassman. Educational Researcher, 33(2), 21-25. Gredler, M. E., & Shields, C. C. (2008). Vygotsky’s legacy: a foundation for research and practice. Guilford Press. Greenberg, T. (2007). The psychological impact of acute and chronic illness (1-176). Francisco, CA: Springer. Hofmann, S. G., Meuret, A. E., Smits, J. A., Simon, N. M., Pollack, M. H., Eisenmenger, K., Shiek, M., & Otto, M. W. (2006). Augmentation of exposure therapy with D-cycloserine for social anxiety disorder. Archives of General Psychiatry, 63, 298-304. Homskaya, E. D. (2001). Alexander Romanovich Luria: A Scientific Biography. New York: Kluwer Academic/Plenum Publishers. Homskaya, E. D. (2010). Hrestomatiya po neiropsihologii [Chrestomathy of neuropsychology]. St. Petersburg, Russia. James, W. (1981). The Principles of Psychology. Cambridge, MA: Harvard University Press. Jeffries, F. W., & Davis, P. (2013). What is the Role of Eye Movements in Eye Movement Desensitization and Reprocessing (EMDR) for Post-Traumatic Stress Disorder (PTSD)? A Review. Behavioural and Cognitive Psychotherapy, 43, 290-300. Judd, T. (1999). Neuropsychotherapy and community integration. Brain illness, emotions and behaviour. New York, NY: Kluwer Academic/Plenum Publishers. Kandel, E. (1998). A new intellectual framework for psychiatry. The American Journal of psychiatry, 155(4), 457-469. Kandel, E. (2005). Psychiatry, psychoanalysis and the new biology of mind. Washington: American Psychiatric Publishing. Kaplan-Solms, K., & Solms, M. (2000). Clinical studies in neuropsychoanalysis. London: Karnac books. Karpov, Y. V., & Haywood, H. C. (1998). Two ways to elaborate Vygotsky’s concept of mediation. Implications for instruction. American Psychologist, 53(1) 27-36. King, L. A., & Hicks, J. A. (2012). Positive affect and meaning in life. In P. T. P. Wong (Ed). The Human Quest for Meaning (2nd ed. ), (pp. 125–140). New York, NY: Routledge. Kleinman, A., & Seeman, D. (2000). Personal experience of illness. In G. L. Albrecht & R. Fitzpatrick & S. C. Scrimshaw (Eds. ), Handbook of Social Studies in Health and Medicine (230-243). London: SAGE Publications Ltd.
Kostyanaya, M. I., & Rossouw, P. J. (2013). Alexander Luria – life, research and contribution to neuroscience. International Journal of Neuropsychotherapy, 1(2), 47-55. Kozulin, A. (1996). Commentary. Human Development, 39, 328-329. Kuzovleva, E., & Das, J. P. (1999). Some facts from the biography of A. R. Luria. Neuropsychology Review, 9(1), 53-65. Laaksonen, R. & Ranta, M. (2013). Introduction to neuropsychotherapy. Guidelines for rehabilitation of neurological and psychiatric patients throughout the lifespan. New York and London: Psychology Press. Taylor & Francis group. Lambert, M. J., & Ogles, B. (2004). The efficacy and effectiveness of psychotherapy. In M. J. Lambert (Ed. ), Bergin and Garfield’s handbook of psychotherapy and behavior change (5th ed., pp. 139-193). Hoboken, NJ: Wiley. Leontiev, A. N. (1979a). The problem of activity in psychology (pp. 37-71). In J.V. Wertsch (Ed.). The concept of activity in Soviet psychology. Armonk, NY: Sharpe. Leontiev, A. A. (1979b). Razvitie vysshih form zapominaniya // Hrestomatiya po obschey psihologii: Phihologiya pamyati. [The development of the highest forms of memory // Chrestomathy on general psychology]. Moscow. Leontiev, A. N. (1983). Izbrannye psikhologicheskie proizvedeniia. [Selected psychological works] vol. 2. Moscow. Leontiev, A. N. (2000). Lektsii po obshchei psikhologii. Moscow. [Lectures on general psychology]. Moscow. Leontiev, D. A. (2005a). The life and creative path of A. N. Leontiev. Journal of Russian and East European Psychology, 43(3), 8-69. Leontiev, D. A. (2005b). Three facets of meaning. Journal of Russian and East European Psychology, 43, 45–72. Leontiev, A. A. (2006). “Units” and levels of activity. Journal of Russian and East European Psychology, 44(3), 30-46. Leontiev, D. A. (2012). Personal meaning as the basis of motivational processes. In D. Leontiev (Ed. ), Motivation, consciousness, and self-regulation (pp. 65–78). New York, NY: Nova Science Publishers. Leontiev, D. A. (2013). Personal meaning: a challenge for psychology. The Journal of Positive Psychology: Dedicated to further research and promoting good practice, 8(6), 459-470. Lewis, R. D., Hutchens, T. A., & Garland, B. L. (1993). Cross-validation of the discriminative effectiveness of the Luria-Nebraska Neuropsychological battery for learning disabled adolescents. Archives of Clinical Neuropsychology, 8, 437-447. Linden, D. (2006). How psychotherapy changes the brain – the contribution of functional neuroimaging. Molecular Psychiatry, 11, 528-538. Linford, L., & Arden, J.B. 2009. Brain-based therapy and the “Pax Medica”. Psychotherapy in Australia, 15, 16-23. Lomov, B. F. (1984). Metodologicheskie i teoreticheskie problemy v psihologii [Methodological and theoretical problems of Psychology]. Moscow: Nauka. Louis, G. W. (2009). Using Glasser’s choice theory to understand Vygotsky. International Journal of Reality Therapy, 28(2), 20-13. Luria, A.R. (1932). The Nature of Human Conflicts – or Emotion, Conflict, and Will: An Objective Study of Disorganisation and Control of Human Behaviour. New York: Liveright Publishers. Luria, A. R. (1966). Higher cortical functions in man. New York: NY: Basic books. Luria, A. R. (1976). Cognitive development: its cultural and social foundations. UK: Cambridge University Press. Luria, A. R. (1979). The making of mind: A personal account of Soviet psychology. M. Cole & S. Cole. (Eds.). Cambridge, MA: Harvard University Press. Masterpasqua, F., & Healey, K. N. (2003). Neurofeedback in psychological practice. Professional Psychology: Research and Practice, 34(6), 652-656. Nader, K., & Hardt, O. (2009). A single standard for memory: the case for reconsolidating. Nature Reviews Neuroscience, 10, 224-234. Ochsner, K. N., Ray, R. D., Cooper, J. C., Robertson, E. R., Chopra, S., Gabrieli, J. D., & Gross, J. J. (2004). For better or for worse: neural systems supporting the cognitive down- and up-regulation of negative emotions. Neuroimage, 23, 483-499. Purisch, A. D., & Sbordone, R. J. (1986). The Luria-Nebraska neuropsychological battery. Advances in Clinical Neuropsychology, 3, 291-316. Raboni, M. R., Tufik, S., & Suchecki, D. (2006). Treatment of PTSD by eye movement desensitisation reprocessing (EMDR) improves sleep quality, quality of life, and perception of stress. Annals of the New York Academy of Sciences, 1071, 508-513. Reker, G. T., & Wong, P. T. P. (2012). Personal meaning in life and psychosocial adaptation in the later years. In P. T. P. Wong (Ed), The human quest for meaning (2nd ed. ), (pp. 433–456). Routledge. Rossouw, P. J. (2011). Neuropsychotherapy – origins and directions. Neuropsychotherapy, 6, 2-5. Rossouw, P. J. (2012). Effective client focused interventions: The top-down and bottom-up discourse. Neuropsychotherapy News, 11, 2-5. Rossouw, P. J. (2014). Neuropsychotherapy: theoretical underpinnings and clinical applications. Brisbane: Mediros. Shapiro, F. (1996). Eye-movement desensitisation and reprocessing (EMDR): Evaluation of controlled PTSD research. Journal of Behavior Therapy and Experimental Psychiatry, 27(3), 209 – 218. Schnell, T. (2009). The sources of meaning and meaning in life questionnaire (some): Relations to demographics and well-being. Journal of Positive Psychology, 4, 483–499. Schonfeldt-Lecuona, C., Connemann, B. J., Spitzer, M., & Herwig, U. (2003). Transcranial magnetic stimulation in the reversal of motor conversion disorder. Psychotherapy & Psychosomatics, 72, 286-288. Smith, M. L., Glass, G. V., & Miller, T. I. (1980). The benefits of psychotherapy. Baltimore: Johns Hopkins University Press. Sokolova, E. E. (2005). Introduction. The formation of activity psychology. Journal of Russian and East European Psychology, 43(4), 3-7. Sokolova, E. E. (2008). Osnovnye polozheniya neklassicheskoy psihologii L. S. Vygotskogo [Fundamental principles of non-classical psychologSulmacy, D. (2002). A biopsychosocial-sipitual model for the care of patients at the end of life. The Gerontologist, 42(3), 24-33. Sulmacy, D. (2002). A biopsychosocial-sipitual model for the care of patients at the end of life. The Gerontologist, 42(3), 24-33. Titchener, E. B. (1902). Experimental psychology: A manual of laboratory practice. (Vol. 1) New York, NY: MacMillan & Co., Ltd.
Tulviste, P. (1988). Neudovletvoritelnoe sostoianie v psikhologii i ego prichiny [The unsatisfactory situation in psychology and its causes]. Voprosy Psikhologii, 2, 5-18. Vygotskaya, G. (1999). On Vygotsky’s research and life. In S. Chaiklin, M. Hedegaard, & U. J. Jensen (Eds. ), Activity theory and social practice. (pp. 31-38). Oakville, CT: Aarhus University Press. Vygotsky, L. (1978). Mind and Society: The Development of Higher Mental processes. Cambridge, MA: Harvard University Press. Vygotsky, L.S. (1987). Thinking and speech. In R.W. Rieber & A.S. Carton (Eds. ), The collected works of L.S. Vygotsky, Vol. 1: Problems of general psychology (pp. 39–285). New York: Plenum Press. Vygotsky, L. S. (1999). Myshlenie i rech [Thought and language]. Moscow: Labirint. Walter, H., Berger, M., & Schnell, K. (2009). Neuropsychotherapy: conceptual, empirical and neuroethical issues. European Archives of Psychiatry and Clinical Neurosciences, 259(2), S173-S182.